Buying a new home is always an exciting experience. Whether it’s your first home or your fifth, it’s important to find the right floor plan that will fit how you and your family live. What do you need in your new home that you don’t have now? Walk around your current home and note the features you need or wish you had that will make life easier in your new home. Maybe you love the entertain but feel isolated from your guests or family because the kitchen is located away from your living areas. Maybe you have younger children and want to be able to keep an eye on them regardless of your location in your home. Or maybe you have too much space and want to downsize. Keep these elements in mind while you’re touring new homes. What is your family stage? What size home will you need? Couples looking to start a family (or expand) will want something different from couples who have adult children with their own homes. Do you need room to care for an elderly family member? Think about your family and any accessibility needs to help determine the layout and number of bedrooms and bathrooms you will need. Consider if the floorplan is flexible; while a floorplan may fit now, it may not work in the future as your family grows (or shrinks as children move out). Will you be able to convert current rooms into new functional rooms (e.g. changing a den/office space into a guest bedroom). Do you entertain a lot or have a large family? Do you have an active lifestyle and will need storage space for your equipment or toys? Do you expect to host overnight guests throughout the year? Do you work from home? 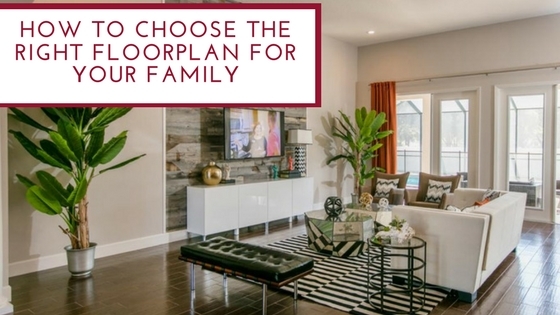 Your current lifestyle will impact the type of floorplan that works best for your family. If you like to entertain, a home with a traditional plan with separated rooms may not be the best option for you. Will you need a dedicated space for hobbies? Now for the fun stuff! After the required rooms are settled, it’s time to think about how your home can support your other interests. If you work from home, you will most likely want a dedicated office/den space. Perhaps you want a craft/activity room for your children or yourself or even a home gym. See if the floorplans you’re considering can accommodate these dedicated spaces. Taking time to consider the features you need in your new home is a time-consuming but important step to make sure you choose the right floorplan. Southern Homes offers a variety of floorplans for each life stage, from young families to empty-nesters. Visit our website to view our current floorplans today.